A new bill to help strengthen the seller finance industry is gaining support. Earlier this year the Seller Finance Coalition announced that HR 5301: The Seller Finance Enhancement Act had been introduced to the 114th U.S. Congress on May 19, 2016. The Bill proposes to increase the number of owner financed transactions exempt from regulation to 24 per year. For generations, seller financing has been a preferred form of financing for low-income homeowner transactions and has allowed thousands of individuals who would not otherwise be able to own their own home the opportunity to settle down and become homeowners. The seller can be a private individual, a small company, or a group of investors who function as a direct lender, financing the sale of property or goods. Unintended consequences stemming from both the Secure and Fair Enforcement for Licensing (SAFE) Act and the Wall Street Reform and Consumer Protection (Dodd-Frank) Act threaten the seller finance industry. While this type of lending is a simple, private loan between two parties requiring no fiduciary involvement, this vital financing mechanism has been under attack from Washington over the past 6 years. The initial blow to the seller-finance industry came in 2008 with passage of the SAFE Act which set forth national guidelines for states licensing mortgage originators. Although they don’t originate Fannie Mae, Freddie Mac, VA, FHA or Reverse Mortgage loans, members of the seller finance industry were suddenly required to take national licensing tests. Not surprisingly, the failure rate for these individuals has been astoundingly high on the 100-question tests designed for mainstream mortgage businesses. With the denial of a license, seller-financiers were left with two unappealing options: restrict the number of transactions to fewer than five per year, or hire a licensed mortgage originator to process the application process – essentially eliminating the inexpensive and simplistic attraction of seller financing. The second blow occurred with passage of the Dodd-Frank reforms that went into effect in January of 2014 which further reduce the number of transactions allowed for unlicensed seller-finance to three per year. These new restrictions erode the opportunities for seller-lenders, thus eliminating a key financing option for would-be homeowners. Many of the home buyers that are attracted to seller-financed homes are lower-income buyers; buyers who would not otherwise be able to find loans in the housing markets in which they hope to raise their families. It is for these reasons that I have introduced H.R. 5301, the Seller Finance Enhancement Act. This bill would simply exempt seller financers who originate not more than 24 mortgages in a 12-month period from mortgage lending rules under the SAFE Act and Dodd-Frank Act. Please help us in protecting this vital lending industry and cosponsor the Seller Finance Enhancement Act. For more information or to sign onto this bill, please contact Sean Dillon in Rep. Roger Williams’ office. “This bill amends the S.A.F.E. Mortgage Licensing Act of 2008 to exempt from certain licensing and registration requirements any person (other than a depository institution) who: (1) originates not more than 24 residential mortgage loans in a 12-month period, and (2) only originates residential mortgage loans for property owned by that person. For determining whether a residential mortgage loan meets minimum standards, the Truth in Lending Act is amended to prohibit the application to loans originated by such a person certain Consumer Financial Protection Bureau guidelines and regulations relating to ratios of total monthly debt to monthly income. What Can You Do To Help Seller Financing Laws? Our actions and voices matter in this fight to reduce restrictions placed on seller financing. So how can we help? Let your representative know this Bill matters and you want their support. The Seller Finance Coalition has made this easy by providing a press release and grass roots letter template to get you started. This organization is working hard to promote awareness and support for improved laws. You can learn more about HR 5301 and access the letter template at the SellerFinanceCoalition.org website. If you can assist monetarily there are membership levels starting at $100 per year to help support the lobbying efforts. 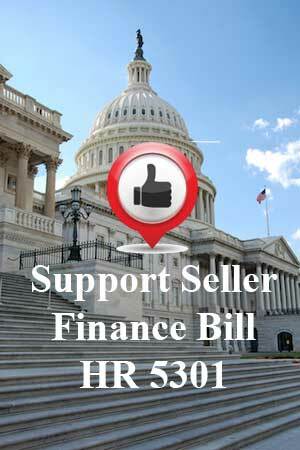 Please take a few minutes today to let your congressman know this seller finance legislation matters. There is no rationale for limiting seller financed transactions other than to drive business to the banks who wrote the bill through their lobbyists.